Take a look at your computer, phone and tablet. The chances are they are encrusted with dirt, grease and are home to some germs that can be harmful to your health. Forget that old clichéd quote regarding our toilets being cleaner than our kitchens – nowadays, our smartphones contain ten times more bacteria than our toilet seats. This isn't surprising, as our bathrooms are regularly cleaned, but when was the last time you even wiped a cloth over your tablet, laptop, keyboard, TV or games console? Researchers have discovered a range of bacteria living in the tech we use on a daily basis. The habit of eating at our desks coupled with poor tech hygiene has meant bugs such as staphylococcus aureus have been found, which can cause upset stomachs, leading to the illness being dubbed 'Qwerty tummy'. And in an office environment, food crumbs can attract mice and other pests, which in turn leave droppings, which offer an even richer breeding ground for germs. In one reported case a keyboard was so badly infected, it was ordered quarantined, as it contained 150 times the acceptable levels of bacteria. You can take a test to see how many germs are potentially living on your keyboard right now at CyberClean. Should your keyboard be quarantined? The approach you take to cleaning your devices will largely depend on how soiled they are and how much you want to spend on cleaning products. The Wall Street Journal for instance found that a microfiber cloth and plain tap water was the best for cleaning screens – no fancy solutions were used. However, it has been shown that a 50/50 mix of water and white vinegar can be highly effective at cutting through grime and grease. Care should be taken, however. There are rugged examples of technology, but most of the devices we all use on a daily basis need to be treated with care, especially when cleaning them. Pressing too hard on your LCD TV for instance could burn out a pixel. And think about the basic tools you will need. As already mentioned the microfiber cloth is vital. Don't use cotton wool for instance. You might think it feels soft to the touch, but it's abrasive to delicate screens. First off, check the manual for your tech before you begin scrubbing, as some cleaning products could damage your sensitive devices. And any special screen coating could be wiped away if the right cleaning product isn't used. Most smartphones have what is called an oleophobic coating, which is designed to reduce fingerprints. Using the wrong cleaning products could damage this coating, and make your phone or tablet even more susceptible to dirt and grease. Make sure your PCs, tablets and phones are off before you begin to clean them. This is especially important to avoid damaging your keyboard. Keyboards will often have to be dismantled before they can be cleaned properly. Target the loose dirt and other detritus that has accumulated on your keyboard or other peripherals first. Use canned air to remove any stubborn debris. Don't blow on your keyboard (or other device) as your breath is moist and you just spray droplets of saliva onto your hardware. 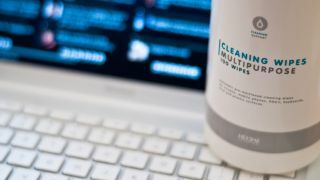 A product like Cyber Clean is ideal for this task. OXO also has a handy cleaning brush (see the above video) made from silicone that is retractable to protect it. Don't use household cleaning products as many contain bleach, which can damage sensitive equipment. The cleaning solutions from companies such as Muc-Off and iKlear have been specially formatted to effectively clean electronic devices. And don't spray the cleaner directly onto your device. Spray onto a microfiber cloth and then apply to your tech. The Stylus Pro is a liquid spray, cleaning cloth and stylus all in one device, which is great for cleaning on the move.